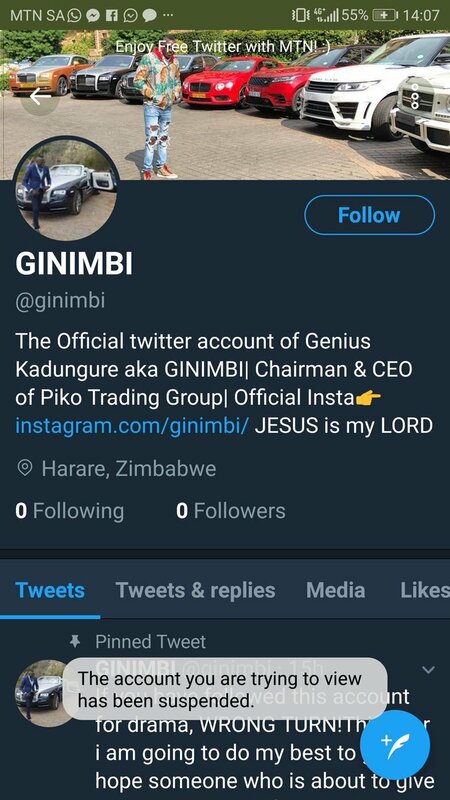 Flamboyant businessman Genius Kadungure, popularly referred to as Ginimbi has dismissed claims that he owes any money to South African based businessman Mutumwa Mawere. The two had a falling out and exchanged words on social media site Twitter, over the weekend after Mawere asked Kadungure to pay back what he owes. Speaking to H-Metro about the issue, Kadungure claimed that he had paid back all that he owed and said that the money could have gone to meeting part of Mawere’s legal fees when he was arrested in South Africa. Otherwise, if he feels I owe him money he should go to the police and not Twitter. I have moved back to Zimbabwe but I am here and not running from anyone. I am ready for him, ready to face the court challenge, not these Twitter funnies. He is abusing Twitter and that is the problem with free Internet but he (Mawere) needs to find somewhere else to play. Ironically, Kadungure’s Twitter account was suspended barely 4 days after being opened.